Strangest of all are the doors–there are none. Every doorway is a wide-open passageway–even the bathroom! Who lives in a house with no doors? I received a free copy of this book from the author, and have voluntarily read and reviewed it. All thoughts / opinions expressed are my own. When the Rothbaum children’s father ends up in a coma, they must go to live with their previously unknown Aunt Gladys. As strange as Aunt Gladys may be, the children find her door-less home to be even stranger. Discovering where the doors have gotten to and what Aunt Gladys does in her secret room all day puts the children in harms way, but the four of them together have what it takes to make it through the danger in order to save their family. 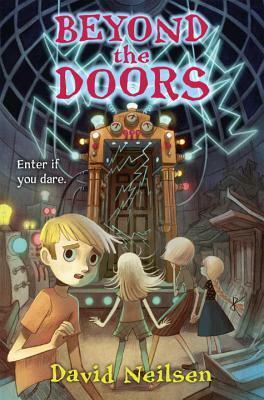 Beyond the Doors is a creepy, quirky adventure that should appeal to book loving boys and girls everywhere! What an imagination Mr. Neilsen has – there is a very good reason that Aunt Gladys’ doors are missing, and you will be as surprised as the Rothbaum’s to learn what it is. Each of the four Rothbaum siblings is a unique, believable, person with his or her own strengths and weaknesses. They quibble like any other brothers and sisters, but in the end, they are family and they stick together. This was a very enjoyable read, even for this well-past-middle-grade mom of two, and I highly recommend it. David Neilsen is a classically trained actor and professional storyteller from Tarrytown and Sleepy Hollow who has performed all over New York City, Westchester County, and the Hudson Valley. Specializing in traumatizing children for life during the Halloween season, he has performed in such locations as the New York Botanical Gardens, Sleepy Hollow Cemetery, and Washington Irving’s Sunnyside in addition to warping minds at various schools and birthday parties. He has also created a number of one-man shows based on the works of author H.P. Lovecraft, as well as an educational show based on the life of Revolution-era British Spy, Major John Andre. His debut Middle Grade novel, Doctor Fell and the Playground of Doom–published by Crown Books for Young Readrs in 2016–was named an Editor’s Pick by Amazon and was a Semifinalist for Best Middle Grade / Chidlren’s Book in the 2016 Goodreads Choice Awards. His second book, Beyond the Doors, will be published in August, 2017. Read my previous interview with author here. Really made it sound worth reading. Thanks. Love great middle grade books. Anything that gets kids to read is an A+ in my books. This one sounds fun. Agreed – I have one who has always loved books, and a much more reluctant reader. This one would even keep her intetest! I love his About the Author description!